One question I get all the time is "How in the world, do you fly with your kids for all those hours by yourself"? Seriously, I'm asked this question about once a week from someone in my family, friends or an Instagram mama, all up in my DM's like "GIRL, teach us"! Well, here goes - In my early years as a model, I loved working abroad! I mastered the art of traveling on repeat trips to Paris or South Africa for work. By my mid 20s, I already felt like a travel pro. When my children came into the picture, I vowed to not let being a mama take one of my favorite things away from me, travel. I made it a point to plan yearly family vacations and extend work trips into holidays and take them along with me as often as I could. I always knew I wanted to travel with my children before I even had them! On my first few flights with my son, I made a lot of mistakes. I quickly learned from each mistake and noticed that with each flight the process became so much easier. By the time my daughter Lily came along, I had my routine in place and all the confidence in the world, so flying with them both became a breeze. Over the past few years, we've made sweet memories traveling across Europe, the Caribbean and a touch of Asia. With this Summer being our most ambitious adventure to date, traveling from NYC > Lisbon > Maldives > Lisbon > NYC. Our 3 week excursion meant 8 flights totaling 41 hours in the air. Yes, I did that! After putting in all of those hours, I now declare myself a travel mama pro! I realized the key to traveling with children is being prepared and having full confidence that you can handle whatever comes your way. Here are some tips and tricks that I’ve learned along the way to help you prep for your next family adventure! They say fly early to avoid getting stuck at your destination. If you miss an early flight, you have a better chance getting to your destination that same day, with more flights leaving later. I use that advice, but for longer flights, I like to fly out in the evening so my kids can sleep for most of the flight, which I find extremely helpful. If you choose this option, make sure you give yourself and extra time to get to the airport to make sure you wont miss your flight. Skip the budget, multi-stop ticket and fly directly to your destination when you are with the little ones. Trust me, the convenience will be worth every penny. If your destination requires a connection, make sure you leave enough time between landing and your next flight. Give yourself at least three hours. That's enough time to let the kids run wild, have a potty break, and grab some food (and a bottle of wine if you're anything like me) to go. When booking your connecting flight, its wise to choose a connection that has more flights leaving that day, just in case you miss your scheduled one. On our recent trip to the Maldives from Lisbon, we missed our connecting flight in Dubai which had 2 hours in between. It was convenient that we made the next flight that was leaving in an hour. As soon as you buy your ticket, select your seats and request a kids meal or any special meal options for yourself at this time. On most airlines you have up until 72 hours before your flight to make this request. When traveling in economy, go for the bulkhead seat (the first row in economy class) which gives you loads of leg room and an option to use the bassinet if your baby is small enough. It's the most coveted seat for tall people and family travelers so good luck snagging one! If this selection is "taken" online, try calling the airlines with this request. Some airlines block out these seats online. If the bulkhead is taken, I always go for a row close to the bathroom. This will be a place you will have to go to often, might as well make it close. Especially if I'm traveling alone with the kids. During check-in, ask to see if there are better seats available or empty rows. If so, ask to be moved to score a bonus seat! Sign up for frequent flyer miles for yourself and the kids. Those miles add up and can be used to upgrade on future flights. If your budget can allow it, it's worth the extra bucks to move to premium economy to get some extra room. With children in tow, every inch counts! 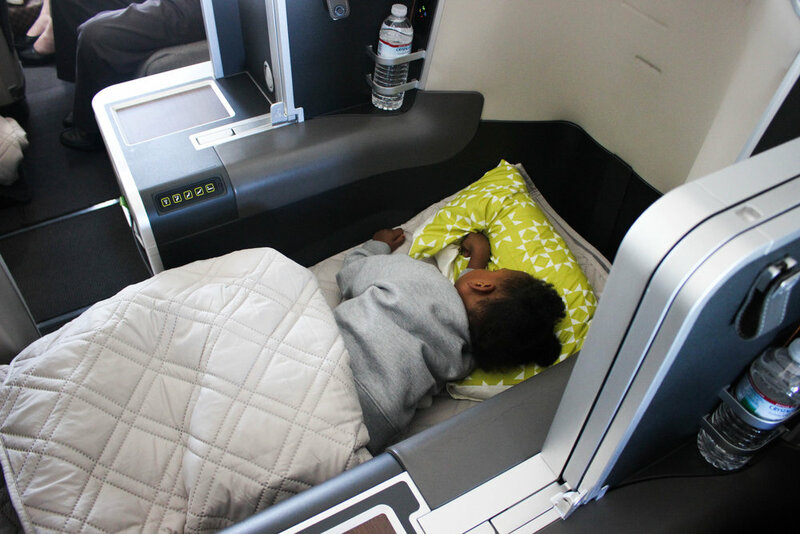 Business class can be tricky with busy toddlers. It can be hard to parent them with a big partition in between. It's also stressful when they are making a lot of noise and playing with all the buttons and putting the chair up and down. I actually prefer premium economy until they are old enough to handle their own chair. Take as many trips with your child while they are under 2 years old and Free.99! The more you fly with your babies, the better fliers they are in toddlerhood. I know it’s cute, but SAY NO to carry on’s for toddlers for international travel. Especially if you are traveling alone. If they really want to bring it, check it in! It’s only a matter of time before they abandon it and now you have one extra thing to carry. Remember you have to get through customs and security when you land at your destination. I only take one carry on with all the things we'll need in flight, my baby bag and a teeny crossbody purse. I keep our passports and boarding passes in my crossbody purse for easy access at all the checkpoints. This tip is a life saver! Trust me, there's nothing worse than franticly searching through your baby bag for your passports and boarding passes. I also keep my cell phone, credit card, arrival details and some cash in there as well. Make sure to put return info in there too, just in case it gets lost. There's a ton of gadgets out there that you don't need so make sure to pack your travel gear wisely! Our top 3 travel gear must haves are neck pillows, headphones and our tablets. To make flying fun, I live by these two S’s - Surprises and Snacks! I load up their tablets with new episodes of their favorite shows and new apps. Bring along fun activities, toys, sticker books, treats and a variety of snacks. Don't let them know you added new games, bought them a new activity book or that you packed all their favorite snacks until they get on the plane. This creates so much excitement when you keep pulling surprises out your bag! Leave the bulky stroller at home. I travel with my easy to fold Maclaren, which I check at the gate to my final destination. It's light weight, small enough to maneuver Europe's tiny sidewalks and durable enough for those cobble stone streets! I still travel with it today and I bought it 5 years ago! There are so many new stroller options out there that fold up so small that you can take on flight with you to zip around to your connections/destination. Most international airports have complimentary strollers available or luggage trolleys with a child seat to get around the airport for those connections or to get you through customs. Beware, sometimes there aren't any strollers available, so bring your carrier along if your babe can still fit. 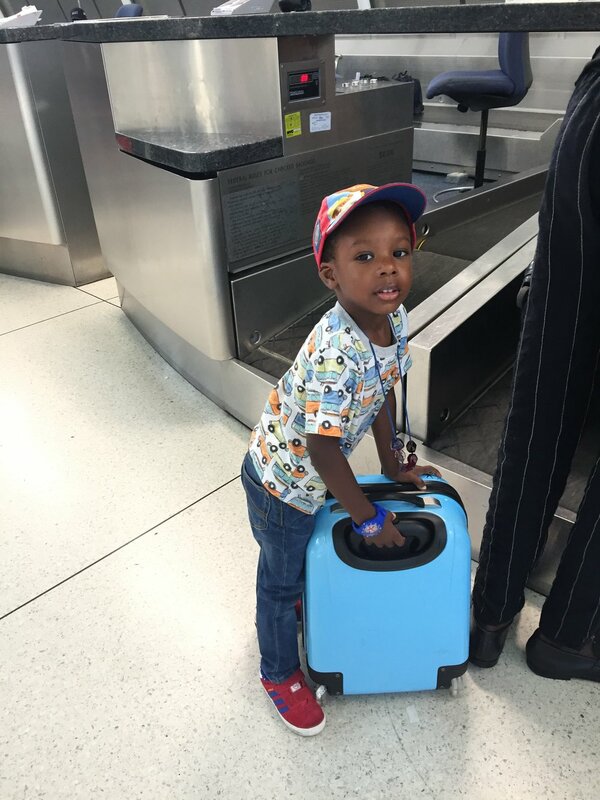 If your toddler can still fit, bring along your carrier to zip through the airport when you land. This Britax baby carrier can be used for kids up to 32 lbs! I used it with both kids and it's great for travel since it's so comfortable to wear and give loads of shoulder and back support. I always smile and say hello to my neighbors when I arrive to my seat. Most likely your kid will end up launching something into their lap at some point, so it’s best to make a great first impression and introduce yourself. Be aware of your child’s moves. Don’t allow them to kick and pull the seat in front of them. Of course kids will be kids, but some things are just unacceptable. We may not be able to control the cries, but we sure can control those pesky kicks. Get acquainted with the flight attendants in your area. Know that they may be your lifeline at some point. Like when you have to make a bathroom run and need someone to keep an eye on your sleeping kids, they'll be there (and when you need some extra wine too). Don't forget to say thank you the crew and ask for a tour of the cockpit on your way out! Lukas still talks about this time he met this pilot! Listen out for the announcement to board the plane first. If they don't make an announcement for families, just walk up and board when they call the first group. It's rare that they'll turn you away if you have the little ones in tow. It's important to go during this time to make it easy for you to settle into your seat and grab all the overhead bin space you need. Airline meals can be tough for a toddler, pack their favorite sandwich or meal along to make sure they eat. On our last flight, I brought along their favorite pasta dish and it was a hit! Pick an airline with great entertainment for long flights - TAP, Air France and Emirates both have great kid activity packages, movies and games. This is a nice bonus in addition to all the goodies you packed along. Take every opportunity to stop at the potty (that includes you*). Especially, before takeoff and on your way to customs. If your child has to go during these times, it's impossible to get to the bathroom. It's better to be precautious than to deal with an accident. Make sure to pack enough diapers and/or put pull-ups on your newly potty trained babe! Make sure to keep a medical kit in your carry on, in case of emergencies. Start your kit with a thermometer and your favorite fever reducer and build from there. My travel kit saved me on my last flight from Lisbon to NYC. Lily had an itchy bug bite and I had a tiny tube of anti-itch cream to ease her discomfort. Kids cry and have meltdowns, it's absolutely normal. Don't beat up on yourself when your kid is having a hard time adjusting to the skies. Do your best to block out the judging eyes and focus of your child's needs. To cool down your fussy child, take a lap around the cabin to calm them down. On our last trip we took a walk to the station in the back to see the flight attendants and Lily ended up dancing with them and they gave her chocolate! Make sure to charge up your phone on the plane and switch to flight mode to save the battery. You will need a fully charged phone when you land. Start packing up your things right before the plane starts it's decent. Look under the chairs, shake out blankets and peek into chair pockets to make sure you have all of your belongings. By the time the plane lands, you'll be ready to go. A week before travel, pull out the globe and talk in depth about your upcoming destination. Watch youtube videos, discuss how long it will take to fly there, learn fun facts and get them all excited about the upcoming destination. Make sure the whole family wears no fuss shoes. No tricky buckles, laces, nothing uncomfortable. There will be several times to take your shoes on and off (security checkpoints, in the cabin) and this really helps to add ease to your trip. When traveling in Europe, look for the priority lanes. If you are traveling with children or pregnant you can cut your wait drastically with these lanes. I always see American families waiting in the regular lanes and I'm like "Heeeey, come over this way, we have priority"! Most airlines have lounges for their frequent flyers. That’s why its important to collect those miles! There you can freshen up, have a meal, take a sip and comfortably relax. Some Airlines allow you to use it for the day if you are flying on their airline for a fee if you are not a member. My favorite travel app is "Mobile Passport". With this app you can get through customs in no time! Just enter your passport info and when you return to America, look for the "Mobile Passport" lane and you are on your way. No forms, No kiosks, just answer the questions in the app when the plane lands and proceed to customs with no stress! I consistently get through customs in under 5 mins since there is never a line in the mobile app lane. If you can't be bothered with all it all, you can hire an airport concierge company to help you zip you through it all. These services can meet you at the gate of your destination, zip you right through customs, pick up your luggage and even arrange your ride home. Just search “airport concierge” in your browser with your desired airport to see the offerings near you. Trick yourself to believing you have less time in the air. When I check in on how much time we have left an 8 hour flight, I don't say to myself "Ugh, five more hours" instead, I say to myself "Great, we're almost half way". I know it sounds corny but trust me it works! Think about your destination or any other happy thoughts! When faced with unexpected setbacks like a missed flight or connection, every minute counts. Instead of getting upset, instantly start looking for solutions. Energy is reciprocated. I always get lucky with extra care from passengers, flight attendants and gate agents. I believe that it's because I always greet them with a smile, say "Hi, Good morning" and give out positive vibes. When you treat others with kindness, they are more likely to help you in any way they can. I even treat grumpy, kid loathing passengers with kindness too. If you are frazzled and stressed, most likely the kids will be too. Stay in tune with your stress levels, when you see yourself unraveling, take a moment to stop, take a deep breath and get back on track. When the kids are getting out of hand, stop what you are doing and try to get them back to center before the full melt down begins. Try giving them some affection, food, a treat, or activity. If they are old enough to have a conversation, express to them how much you need their help right now because traveling can be difficult. I did that with Lukas and he went into mommy's helper mode for the rest of our travel and it was amazing. Good luck on your next family adventure and remember, you got this mama (and you papas too)!